Two Chicks On Books: Blog Tour- CREATORS by Tiffany Truitt Guest Post and a Giveaway! 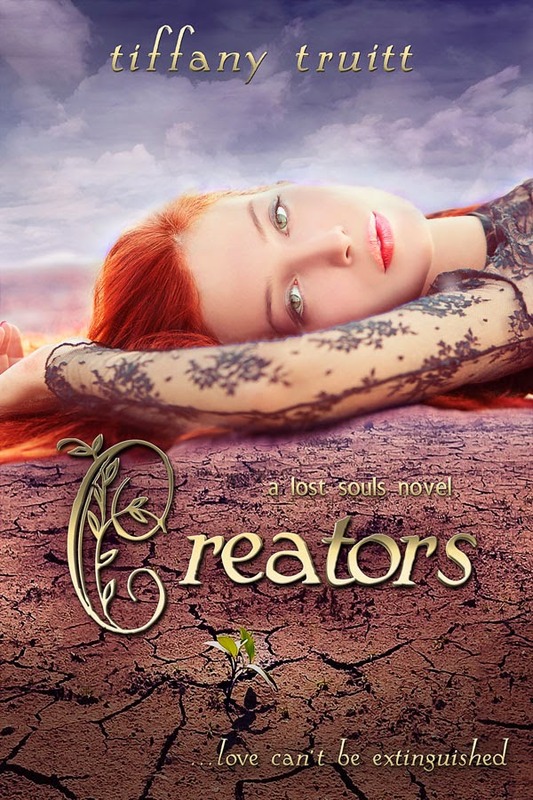 Blog Tour- CREATORS by Tiffany Truitt Guest Post and a Giveaway! I love Tiffany Truitt's books and I am so excited to have her on the blog and do I have a treat for you today! I have a scene from James's POV from her first book CHOSEN ONES! I thought it would be cool to see how he met Tess. Check it out and make sure to enter the awesome giveaway below! Haven't heard of CREATORS? Check it out! Now on to the scene from James's POV!!! I am so excited to be here today to share a bit of the world I explore in my YA dystopian series, The Lost Souls. Book three, CREATORS, releases on April 28th. For today’s stop on the blog tour, I was asked to write the meet cue scene between the series’ doomed loves, James and Tess, from the pov of my male protagonist. While it was definitely interesting writing from James’ point of view, and I hope you enjoy it, please be warned that parts are a bit rough. I never understood what made me stop and go into that room that day. I wasn’t taught to believe in fate; in fact, it was such a distasteful word amongst the creators who educated me that I couldn’t help but cringe whenever I even thought about such a concept---the belief that a power larger than man, bigger than my mind could understand, could direct and lead my life. But, of course, my whole life was dictated by such a power. The council and their creators dictated every gene in my genetic make-up and took from me any possibility of free-will and choice. I was made to be a soldier and nothing else. But that day I did make a choice. No, I could not call it fate. I had decided my destiny that day. The day I met her, and I wouldn’t change it. Not for anything. Not even for one second. I had heard the music slither its way from underneath the closed door. It was dangerous, outlawed. But I had to find the source. Who would be so brazen to play openly as if he didn’t care who heard it. It was widely known that many members of the council and chosen ones had hidden amongst their things contraband books and music, but this was open defiance. There was nothing secret about it. The last thing I had expected to find was a girl. The sight of her playing the piano, lost in a world where she was ruler and I could only watch, caused me to lose all sense of reason. I was swept along with the notes she created, temporarily paralyzed by the freedom it whispered. Standing there, unable to move, barely able to breathe, I took in the Templeton girl. I had seen girls before. Forced into servitude by the council, they were always around our training center. But unlike the other boys who taunted and pawed at them like playthings, I kept my distance. To love was the biggest sin of all. But I couldn’t stop staring at this girl. She wasn’t perfect. Flawed. But it was these flaws, these genetic mistakes, that drew me in like a moth to a flame. A flame that began to burn through me. Consume me. Overtake me. The flames reached my throat, suddenly dry, empty despite all the questions I had for her. All the things I was desperate to know about the beautiful girl who sat before me. Suddenly, her dangerous music stopped, and I knew that I had been caught. Her back straight as an arrow. She would run. It would be the only sensible thing to do. Just as I should have reported her. But in that moment it was the last thing on my mind. I slowly stepped towards the piano, and her head hesitantly turned towards me. I expected to see fear. I was a creature of destruction, after all. But she took me in. I could feel her eyes roam over my face, finally resting on the scar on my chin. The one flaw my creator purposely made in a passive aggressive sign of resistance against the council who abandoned him. In that moment the fire inside of me raged and my hand twitched, recklessly wanting to reach for her. Instead, I placed my hands on the keys. And I played. I played because if I didn’t, I would have touched her. I wouldn’t have been able to stop myself. For the first time in my life I knew what it was to want. And then her hands were dancing across the keys as well. Two people from different worlds, and yet we played such beautifully dangerous music together. It was only when the music stopped that I realized just how foolish I had been. I had committed a crime. With a natural, no less. The council was right. Women were dangerous, and this girl seemed to be the most dangerous one of them all. Just the sight of her, the simple act of her defiance, and I had nearly lost my mind. I was good at following the rules. Five minutes with her and I wanted to break every last one of them. Her eyes danced with mine, but I couldn’t read the emotion behind them. “You should leave,” I whispered, not sure if I was talking to Tess or myself. With a deep breath and a simple utterance, she proceeded to re-define my world. “No.” That no should have infuriated me, but it only made me want to get to know her more. Be as brave as her. Understand her courage. I was pissed. I was elated. I felt all the things that I was told were terribly wrong to feel, and yet, I felt, for the very first time in my life curiosity, and I couldn’t help but laugh. It was absurd, every last moment of our time together. It was like a drug. It muddled my mind. But I wanted more. The girl turned back to the piano and continued to play. A dark thought began to haunt my mind. She didn’t seem to fear me, and I couldn’t help but wonder why. It was no secret that many of the Templeton girls took up with the training chosen ones. Was she one of those girls? So sure her chosen one would protect her that she didn’t fear me? A feeling I couldn’t quite name began to over take me. “How do you know this song?” I asked more harshly than I had intended. Had a chosen one taught her? She should have known not to be foolish to trust one of them. I saw the way the other boys treated the girls, all lies and betrayal. “You do understand that I should report this?” I asked her. “You do know the council won’t just ignore it? There are rules to be followed,” I reminded her. Suddenly, the real world was screaming at me from the other side of the door. If someone else had caught her, she would be in danger. She couldn’t make this mistake again. “With that kind of attitude, you won’t make it long here,” I snapped. Did she want trouble? The same defiance that called to me before now frightened me. I didn’t want to see anything bad to happen to this girl. “You should leave,” I continued, placing my hands on hers. I told myself that I had to touch her, remove her hands from the keys to show her I was serious about her leaving, but the truth was I had to touch her just once. Once before I let her disappear back into her world as I went back into mine. “I don’t know,” I sighed. I should have but I couldn’t. “Isn’t it near time for the transport to take you back?” I asked her. As I moved away from the girl, heading back towards the world where this sort of event would never happen again, I simply couldn’t help myself. With one long last look at the enigma who enchanted me, I said: ““Tess, you are not to do anything like this again. Not under any circumstances.” I would never speak to her again after this moment, but I would make it my business to protect her. I would make it my business to protect her the rest of my life. 1 eBook of any of Entangled Teen;s titles. Open Internationally. Check out the rest of the tour schedule HERE! Fun fact--I went to grad school in the same place Tiffany did! Who knew?